William Kurelek’s Toronto series masterpiece, Hot Day in Kensington Market, which more than doubled its estimated pre-auction value, selling for $472,000 – the second highest on record for the artist . One of the country’s premier auctions was held tonight on May 29 by Consignor Canadian Fine Art, whose live art auction event at the Gardiner Museum concluded with strong results for its offerings celebrating Canadian diversity. 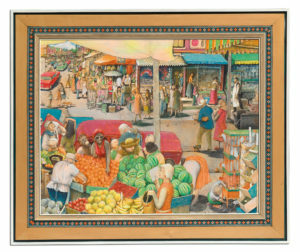 Among the exemplary works up for bid was the auction debut of William Kurelek’s Toronto series masterpiece, Hot Day in Kensington Market, which more than doubled its estimated pre-auction value, selling for $472,000 – the second highest on record for the artist (all prices include an 18 percent buyer’s premium, the lowest in the industry). A second painting by Kurelek entitled Hauling Hay also easily surpassed its pre-auction estimate, selling for $94,400. The most surprising result of the evening was a record set for renowned Canadian war artist, Charles Comfort, whose oil on board titled, Smokestacks, Copper Cliff, sold for $33,040; six-times its auction estimate of $3,000- $5,000. The painting is one of several preparatory sketches to the final canvas, Smelter Stacks, Copper Cliff, which is currently in the National Gallery of Canada’s permanent collection. The previous record for a Charles Comfort work of art was $20,700 (for Hope Island Light, Lake Huron, sold in 2005). Consignor Canadian Fine Art is currently accepting consignments for its upcoming auctions, including the June Online Auction of Canadian and International Artwork, with bidding open at consignor.ca from June 6-13.